Address: 509 S. Iowa Ave.
Three bedrooms, one and a half bathrooms, roomy two-car detached garage and six foot privacy fence. Walking distance to the square, Lincoln Middle School, Washington Jr. High School and High School. -New electric service in 1999. -Expanded and remodeled second floor bathroom in 1999. -Insulated and finished attic 1999-2000. 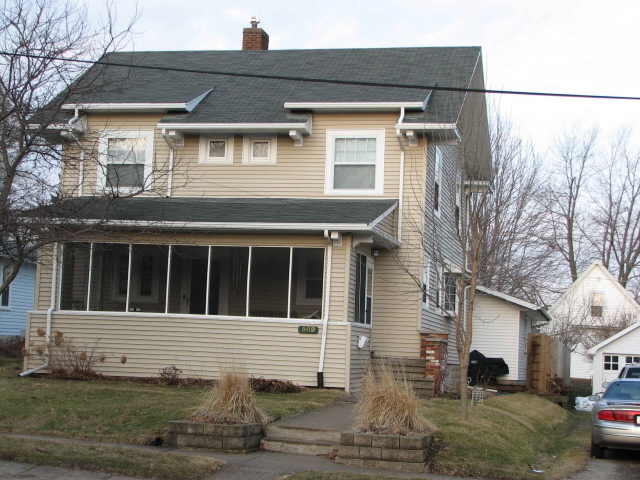 -New vinyl siding in 2001. -New double-pane windows in attic in 2001. -New water heater in 2007. -New wood laminate floor in kitchen and downstairs bath 2008. Major features include: a wood burning fireplace, original walnut-stained oak woodwork (and hardwood flooring), built-in bookshelves, pocket door, large linen closet on second floor, first floor laundry, central air conditioning, screened-in front porch, and full unfinished basement.